Does That Instrument Always Sound Like That? 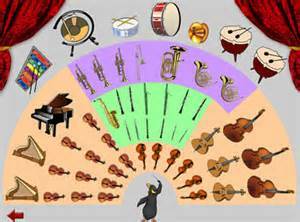 Tomorrow, my fourth grade students will attend a young peoples concert, put on by the local symphony orchestra. This is an annual event, and is by no means the same program each year; however this year, the concert will focus on introducing the audience to the various instruments and instrument families of the orchestra. One of the mainstays of such a program will be represented on the program, that being Prokofiev’s Peter and the Wolf. The other piece, fashioned perhaps after Britten’s famous opus, is The Remarkable Farkle,” which is based on a story by actor John Lithgow and music by Bill Elliott. It, like the Britten, is a series of variations on a theme, each variation played by a different instrument or family. There are two approaches to introducing the orchestra represented in these works. Elliott’s (and Britten’s) approach is to take the same theme, and demonstrate how it, varied to suit the instrument being demonstrated, would sound playing it. This seems like a good approach, because it holds the instrument as something of a variable, and the theme as something of a constant, though a varied one at that. The composer is a liberty to demonstrate several aspects of the sound of an instrument by creatively incorporating multiple playing techniques, as for example with pizzicato, bowing, and col legno with the strings, or open, muted, or stopped with French horns. There is at least the possibility of avoiding an exposure to the expressive possibilities of an instrument that is restricted by a single theme or characterization. Prokofiev’s approach was to compose a separate theme for each instrument, and have each theme/instrument represent a character in the story. It is hard to oppose this method of remembering the timbre of a clarinet by remembering Sasha the cat, or the bassoon by remembering old grandpa, because it has proven successful for many generations. The weakness of this approach, it seems to me, is that it stereotypes the instrument into one kind of melody, one kind of personality, and leaves the listener unaware of the diverse representations a clarinet, or bassoon or what have you can make. It was years after I had first heard Peter and the Wolf that I realized the bassoon ever had anything serious, that is not comical, to play in the orchestral repertoire; and does the flute really always sound like a bird? With this in mind, I’d like to propose some musical works for teaching the instruments of the orchestra to children. For flute, I suggest Prelude to the Afternoon of a Faun by Debussy, Prokofiev’s Classical Symphony, and Mendelssohn’s Symphony 4, the scherzo. For Oboe, listen to the scherzo from Symphony no 6 by Beethoven. This has wonderful solos for oboe, clarinet, and French horn. Also, Symphonie Fantastique, the pastorale movement has a wonderful English horn and oboe duet. Tchaikovksy’s Symphony 4, the first movement, is alternately a showcase of woodwinds and brass, including a bassoon solo, and the third movement is nearly all pizzicato strings. Tchaikovsky’s Symphony 5 begins with a wonderful clarinet solo (actually two clarinets in unison), and features a renowned French horn solo in the slow movement. Rimsky-Korsakov’s Scheherezade is an orchestration delight throughout, with many solo passages including features solos for violin, clarinet, oboe, flute. Other clarinet parts are found in Rachmaninoff’s Symphony 2, the slow movement, and Bartok’s Miraculous Mandarin. Many good trumpet and woodwind parts are also featured in Stravinsky’s Firebird Suite. The trombone is featured in many works by Berlioz, including Hungarian March, Dvorak’s Symphony 8, and Wagner’s Tannhauser. Wonderful examples of the tuba are found in Symphonie Fantasituqe, March to the Scaffold, and The Fountains of Rome by Resphigi in the movement “Fountain of Trevi at Midday.”Familiarizing students with these excerpts or works after they have been introduced to the instruments and families through the standard “introduction to the orchestra” pieces will broaden their understanding and appreciation of each instrument. ← What Are Some Effective Ways to Teach Dotted Rhythms?